Not sure what settings are best for your site? Read our SEO guide here, watch the tutorial videos, or have our SEO experts provide feedback on your setup. Need to configure the Yoast SEO Premium plugin? Use this guide: How to Configure the Yoast SEO Premium Plugin. 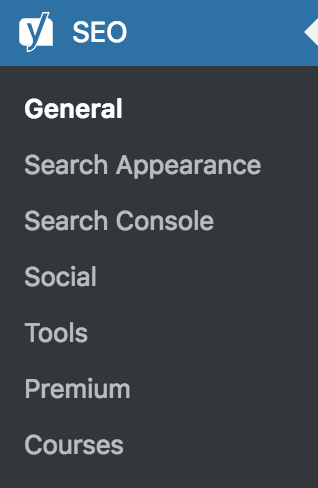 After you have installed Yoast SEO, you will have a new menu available to customize your SEO global settings. The plugin also adds SEO settings at the post, page and taxonomy level. This section includes general things that don't fit elsewhere like (re)starting the configuration wizard which should be the first thing to do. In the configuration wizard, you can configure the most important settings on your site, like define your name for Google's site name markup, modify whether you are an organization or a person for Google's Knowledge Graph, connecting to the various Webmaster Tools, and setting which post types should show up in the search appearances. This sections allows you to customize the title and meta templates that are automatically applied to your content, prevent duplicate content and decide if a certain post type should appear in the search results. This section allows you the option to associate your site with your social media profiles for Google's Knowledge Graph, enable Open Graph meta data, enable Twitter card meta data, and configure other social settings. Warning: This section may require advanced WordPress experience and, in rare cases, may cause problems with other functions of your site. Use with caution. We offer a bulk editor, a file editor, an import/export tool and a text link counter analysis. If you have Yoast SEO Premium, this also includes the analysis for the internal linking tool. If you have claimed your site in Google Search Console, you can retrieve the crawl errors for your site. You can learn more about our premium plugins or view your activation status.